With the Budget just days away, leading MPs have stepped up the pressure on the Government to deliver a Budget that will help keep pubs afloat. 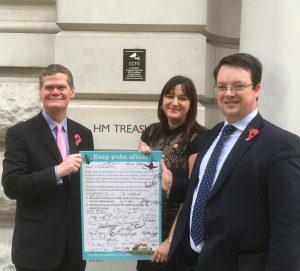 A letter signed by 50 MPs from all parties has been delivered to the Treasury to demonstrate the support for British pubs. It calls on the Chancellor to freeze beer duty for the rest of this Parliament and introduce an annual £5,000 business rate relief for pubs. The letter comes in the wake of a Parliamentary debate in which 24 MPs urged the Government to ease the growing tax burden on pubs, which are on average paying nearly £140,000 in taxes every year. Tim Page, CAMRA’s Chief Executive said: “Pubs play a hugely important role in our social lives and the cohesion of their local communities. They act as a common meeting ground for friends, family and colleagues alike, helping to bring people from all walks of life together. In many areas they are the last remaining public meeting space, with so many libraries and meeting halls already lost. Mike Wood, MP for Dudley South and Chairman of the All-Party Parliamentary Beer Group said: “Nearly one million people work in this industry and the sector contributes £23 billion to our economy. And the Treasury should be very grateful for the £13 billion of taxes that it pays! “The beer duty escalator increased beer duty by a staggering 42% over six years. During this time, the annual decline in sales of beer in pubs nearly doubled and 7,000 pubs called time for good with over 58,000 beer-dependent jobs being lost. “It would be incredibly short-sighted for the government to allow these wonderful community assets to be strangled by yet another duty hike and sky-high business rates."